The story of Italian marble is the story of difficult motion: violent, geological, haunted by failure and ruin and lost fortunes, marred by severed fingers, crushed dreams, crushed men. Rarely has a material so inclined to stay put been wrenched so insistently out of place and carried so far from its source; every centimeter of its movement has had to be earned. “There is no avoiding the tyranny of weight,” the art historian William E. Wallace once put it. He was discussing the challenge, in Renaissance Italy, of installing Michelangelo’s roughly 17,000-pound statue of the biblical David. This was the final stage of an epic saga that, from mountain to piazza, actually began before Michelangelo’s birth and involved primitive and custom-engineered machinery and, above all, great sweating armies of groaning, straining men. But the tyranny of weight was in effect long before that, and long after, and it remains in effect today. What we admire as pristine white stone was born hundreds of millions of years ago in overwhelming darkness. Countless generations of tiny creatures lived, died and drifted slowly to the bottom of a primordial sea, where their bodies were slowly compressed by gravity, layer upon layer upon layer, tighter and tighter, until eventually they all congealed and petrified into the interlocking white crystals we know as marble. ‘‘Marmo,’’ the Italians call it — an oddly soft, round word for such a hard and heavy material. Some eons later, tectonic jostling raised a great spine of mountains in southern Europe. Up went the ancient sea floor, and the crystallized creatures went with it. In some places they rise more than 6,000 feet. Besides, carving Italian marble at its place of origin is precisely not the point. Its major value has always derived from its removal. 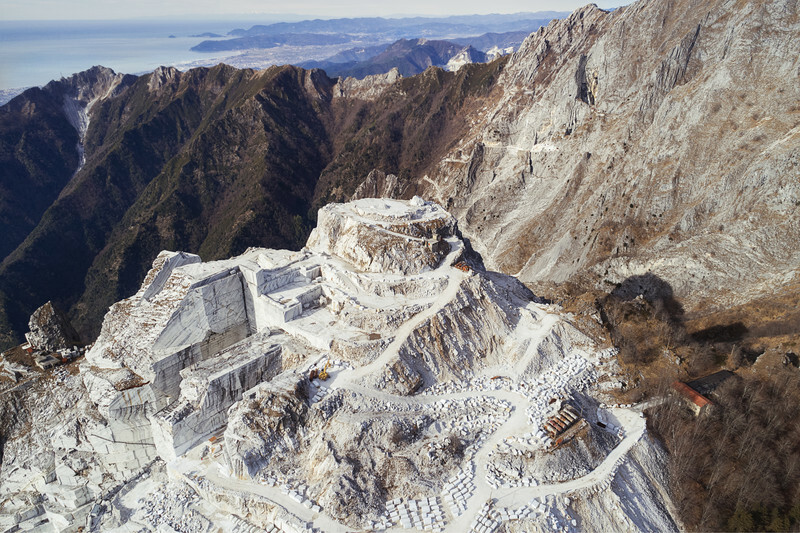 Hundreds of quarries have operated in the Apuan Alps since the days of ancient Rome. (The Romans harvested the stone with such manic intensity that it became the architectural signature of the empire’s power; Augustus liked to boast that he inherited a city of bricks and left it a city of marble.) 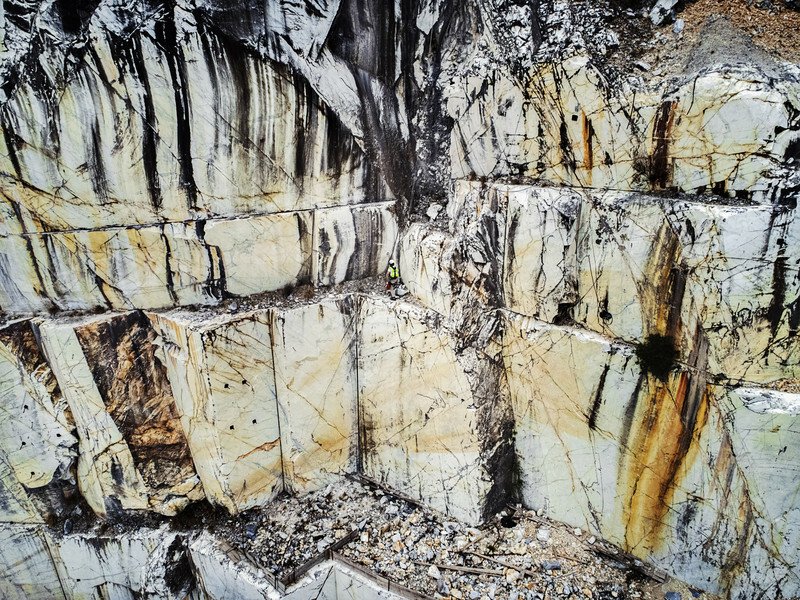 These quarries are far off of Italy’s most-traveled tourist routes, so few visitors see them; most of us know Italian marble mainly as an endpoint in the chain of consumption — not only Renaissance statues in major museums but also tombstones, bookends and kitchen countertops in American McMansions. Kim Kardashian and Kanye West’s wedding reportedly featured, as an extra touch of conspicuous luxury, furniture made of Italian marble. 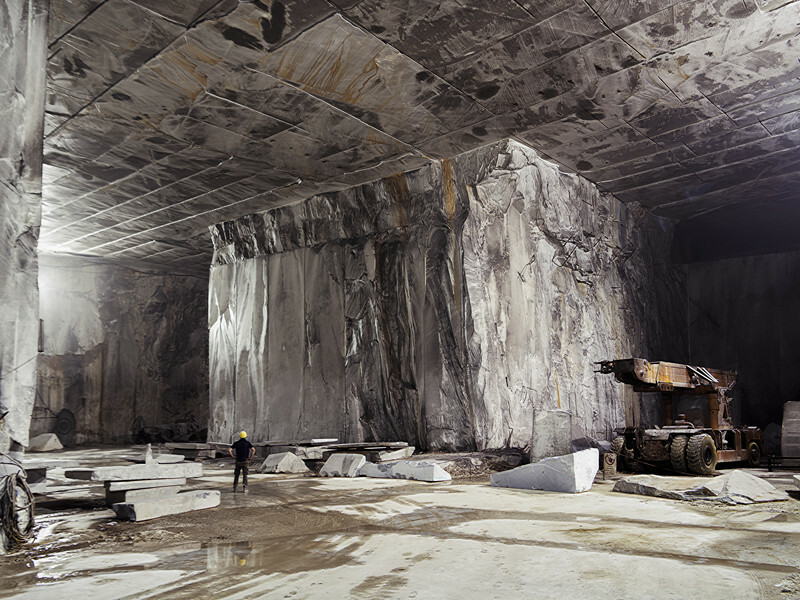 The quarries themselves, as these photos by Luca Locatelli attest, are their own isolated world: beautiful, bizarre and severe. It is a self-contained universe of white, simultaneously industrial and natural, where men with finger-nubs stand on scenic cliffs conducting tractors like symphony orchestras. Over the centuries, the strange geology of the marble mountains has produced an equally strange human community — strange even by the standards of Italy’s fractious regional subcultures. The people there live in white towns, breathing white dust, speaking their own dialects, nursing their own politics. There is a proud history, in and around Carrara, of anarchism and revolt. marble, and you follow the major movements of global wealth in human history, from ancient Rome to Victorian London to 20th-century New York. 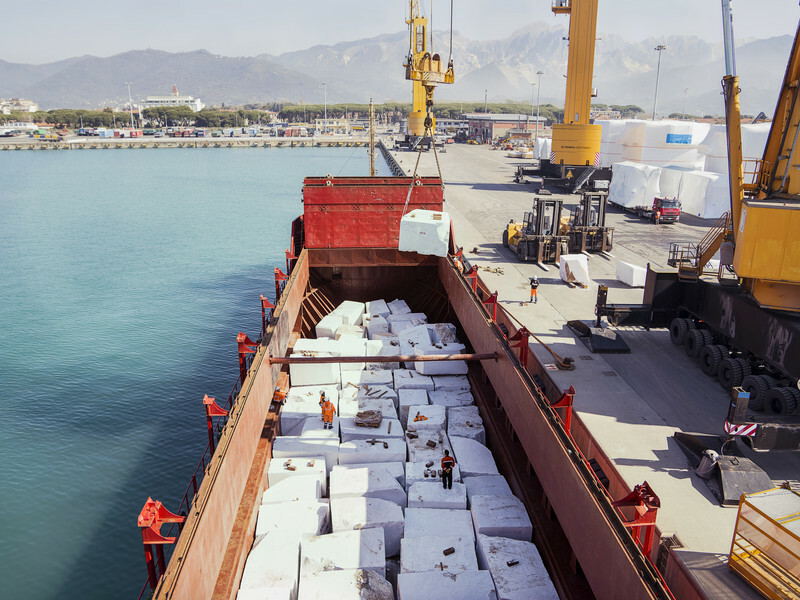 Today Italy’s marble tends to move farther than it did before — not just 200 miles to Rome or 700 miles to London but 3,000 miles to Abu Dhabi and 4,000 miles to Mumbai and 5,000 miles to Beijing. The centers of wealth have shifted, as they always will, and the marble follows, as it always has. The last decade has coincided with feverish marble-based construction, in particular, around Mecca in Saudi Arabia. 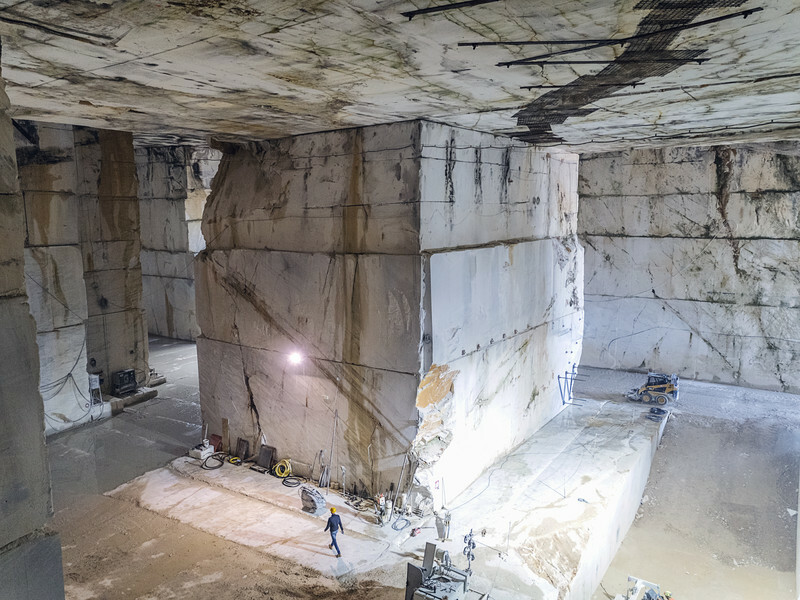 In 2014, the Saudi Binladin Group, one of the region’s major construction firms, bought a large stake in one of Carrara’s largest quarries. The famous white stone is now used not in small batches for art but in bulk for huge building projects: mosques, palaces, malls, hotels. How long can it hold out? 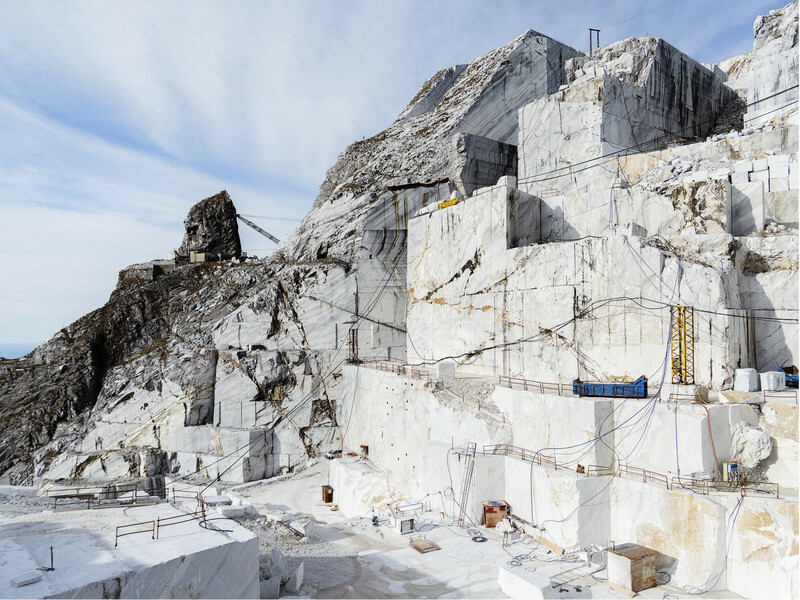 Like North American timber or Antarctic ice, Italy’s marble is not an infinite resource. We will, eventually, reach the end of our ancient fund of calcified creatures, and the process that transformed them into stone is not likely to recur on any time scale we can imagine. These are cycles that outlast species. And although the white stone itself will almost certainly outlive its current quarriers, as it outlived the ancient Romans and Michelangelo, most of it will no longer be in the Apuan Alps: It will be scattered in this worldwide diaspora — in sinks, tiles, altars, skyscraper lobbies, busts.